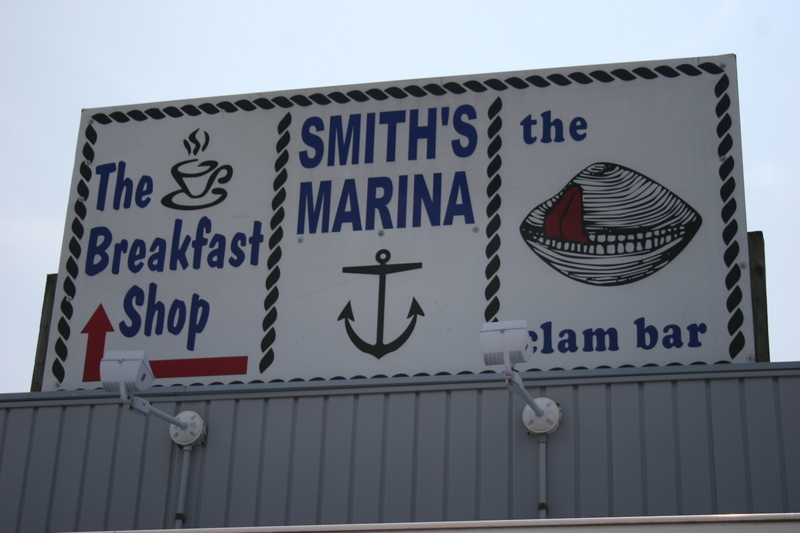 I usually don’t do reviews on lunch spots but my former co-worker and friend, Michael M. asked me to meet him last Tuesday afternoon at “Smitty’s” on Bay Ave. in Somers Point. Evidently, I am the only person in South Jersey who was not familiar with the place because everyone I have mentioned it to during the past week seems to know it well. It’s certainly not a fancy location as it sits on the bay with a small dining room and stools that ring the outside of the place, which is where we ate. Smitty’s doesn’t open until Noon. We were there early and sat on benches until the waitresses came out at 5 till 12 and started setting up the stools. This was a signal for hungry diners to flock to the tiny eatery to partake in a a seafood lunch. I opted for one of the “daily specials”, a chicken and crab salad sandwich. 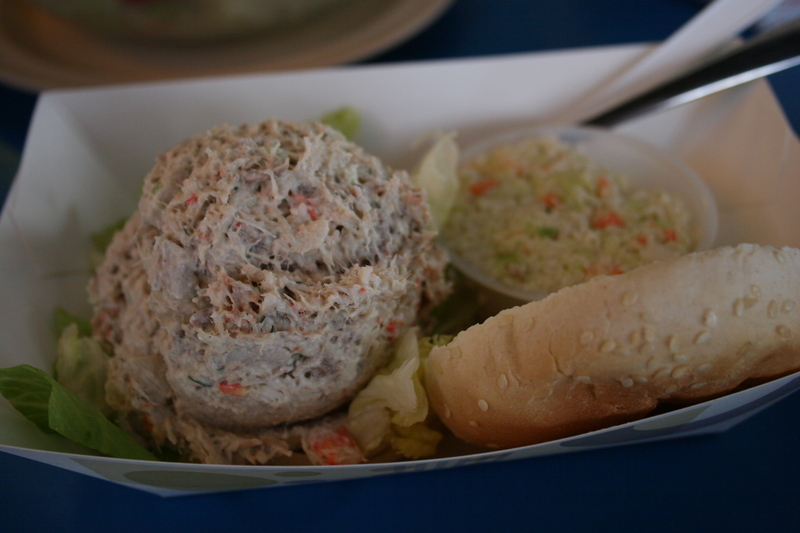 It sounded like a unique combination to add crab meat to the standard chicken salad and it came on a nice fresh roll with a side of creamy cole slaw. It was certainly a tasty sandwich but as good as it was it was NOT the highlight of the meal. Michael insisted I try the New England Clam Chowder. The bowl was over-flowing with hot, creamy soup that was chock full of tasty clams and assorted spices and veggies that would have made the visit worthwhile all by itself. 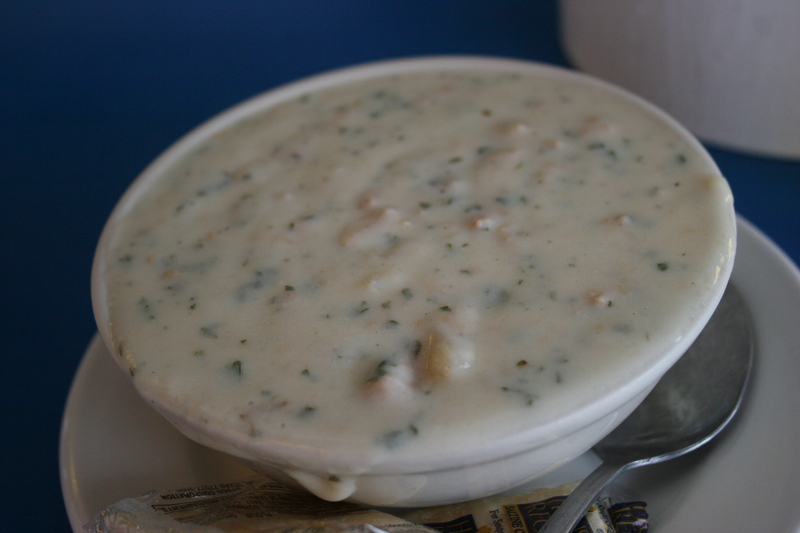 There is nothing quite as satisfying as a really good bowl of soup and the New England Clam Chowder served at the Clam Bar is right up there with some of the best. 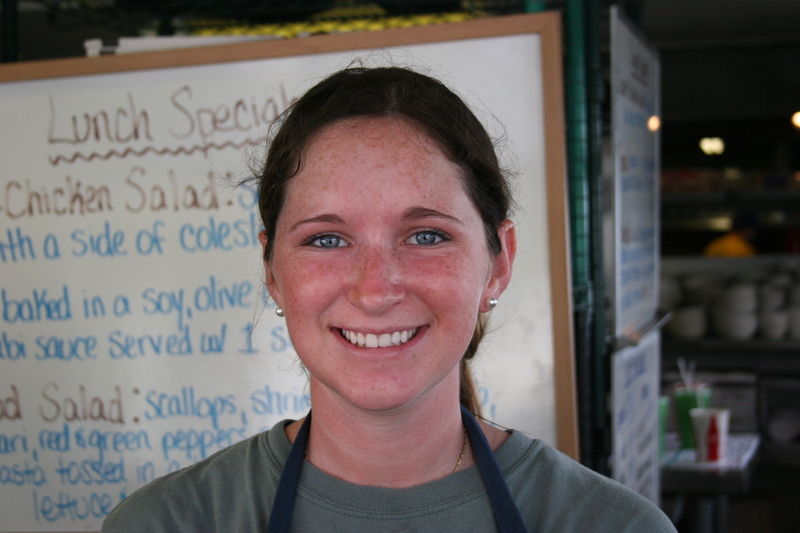 Our server, Hannah, did a great job of filling our order and checking with us frequently to assure that we were enjoying our lunch. It was good to see Michael again, and in between catching me up with the latest misadventures at the AC casino where I once worked, he suggested a take home the seafood salad for another meal. My wife, Kathy, and I shared this back in Avalon and although it was decent, it wasn’t nearly as good as the sandwich or the excellent soup. 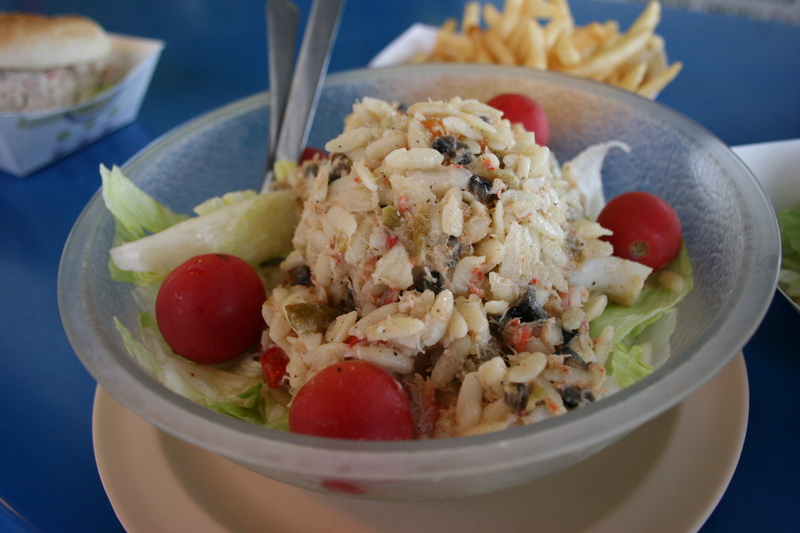 It appeared to contain too much orzo as a filler and not enough fresh seafood. 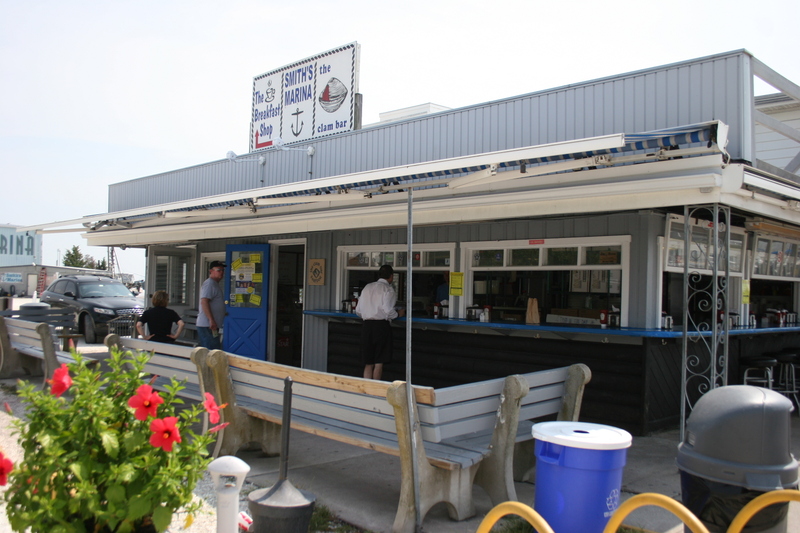 Overall, Smitty’s was a nice experience and it’s quite clear why the locals and the “shoobies” seem to gravitate to this little shack on the bay in Somers Point.